Doris Y. (Ganta) Chase, 83, of Fall River and formerly of Columbus was united with the Holy Spirit on April 3, 2019. She was blissfully reunited with the love of her life, her late husband of 60 years, Bill. Doris was born on Nov. 24, 1935, in Chicago, IL. She moved to the Columbus area as a young lady. She attended Columbus High School which is where she met Bill. They married in 1951 and had 6 children. 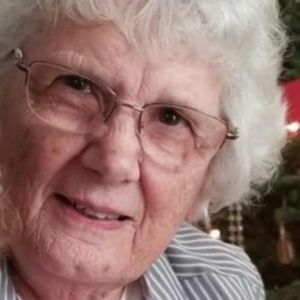 Doris will be best remembered as a lifelong caregiver and a woman who centered her time and energy on her family. She was known as a strong-willed and adventurous gal who enjoyed traveling with and cooking for her family. She was famous for putting on a festive Christmas, making the best potato salad and as a first-class hostess for Sunday morning coffee and rolls after church. Doris is survived by her children: William R. (Linda Peterson) of Beaver Dam, Joann of Fall River, Michael of Pardeeville, Thomas (Donna) of Colorado Springs, CO and Debbie Forseth of DeForest. "Nane's" 11 grandchildren: Justin, Joshua (Andraya Albrecht), Corey (Shannon), Leah, Nicole (PJ McConnell), Jared, Erica, James, Michaela (James Johnston), Amanda and Melissa. Nane is also survived by her 18 great-grandchildren. She was preceded in death by her daughter, Phyllis and her true love, Bill. A visitation will be held at Faith Lutheran Church in Columbus on Tuesday, April 9, 2019 from 10 a.m. until the time of the funeral service at 12 p.m. (noon) at the church. Pastor Sandra Schieble will officiate. Interment will take place at Hillside Cemetery in Columbus. In lieu of flowers, memorials may be directed to the American Heart Association. Add your thoughts, prayers or a condolence to Doris 's guestbook.